In this video, we are talking about FileMaker Server backups – or more precisely, a backup set, that you create for remote backup. Ultimately we want our FileMaker Server to take incremental backup, so we save on processing power and the time it takes to do a backup. But we also want our remote backup software to do incremental backup, instead of moving a full copy every night. Now in order for FileMaker server to do incremental backup, it needs to stamp the backup set folder with a timestamp. However, the Remote Backup software will as a result, see the entire folder and it’s files as changed and therefore it will do a full backup. 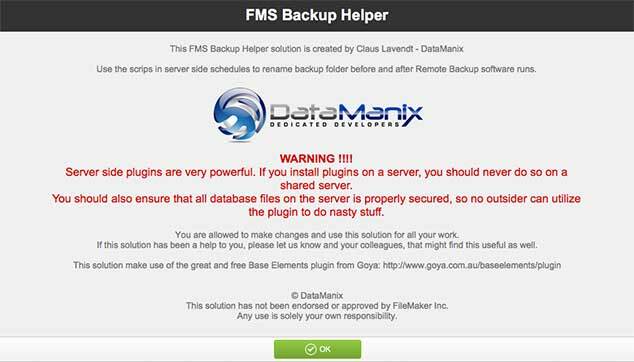 Watch this movie and download the FMS Backup Helper tool to solve this problem, so you can have both the FileMaker Server and your Remote Backup Software do incremental backups, which probably would also save you money on your remote storage backup.